Since there are some people who are still unaware of the Patreon RSS feed or aren't sure what it is, here's a quick explanation I gave to someone just now. RSS is a notification system generally used to be able to track when websites make updates like posting new articles, etc. It's often used behind the scenes for podcast apps to populate when new episodes are released. Since an RSS is a very open and public feed by nature, there's no way to limit access to an RSS feed and put something on it early for some people but not others. So previously, to give patrons early access to our podcasts, we simply gave a link to where it's hosted on soundcloud, and then the person either had to listen to it directly in soundcloud or download the file and manually add it to an audio player or podcast app, which can be a chore. However, now that we've enabled Patreon's RSS feeds there's a simpler option. On the Overview tab of our Patreon, there's an Audio RSS Link that's individually generated for each patron. 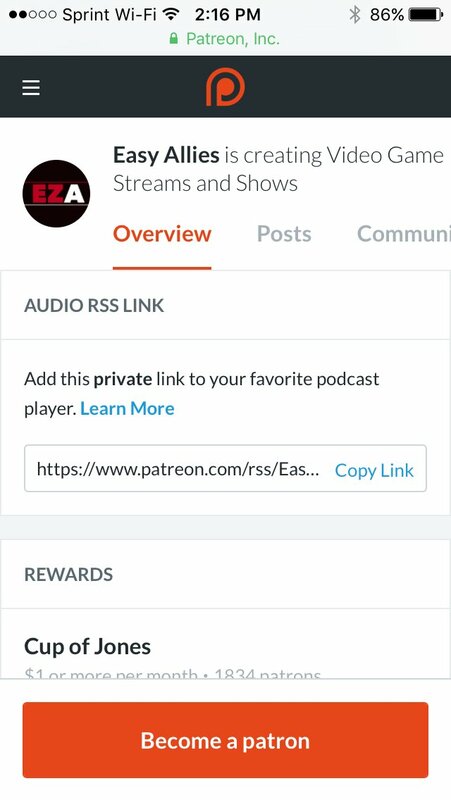 By copying this RSS link and adding it to your podcast app of choice, your app will populate with new episodes automatically whenever we make an audio post and upload directly to Patreon. Since a different link is generated for each individual, you'll only get files that match your patron level. So if you're a $1 patron, you'll get access to $1 content, but not $5 content, etc. However, all of that early access content does populate the same feed. So Reaction Shots, Zelda Talk, the main podcast, etc. are all mixed together. Oh wow, I had no idea about any of this. I typically listen to the podcast during my long drive to work, and I always thought I had to wait until later on Friday to use the Apple podcast app. Thanks for the info, @Bloodworth! I already tried it and it works perfectly! Perfect! Thanks for adding this! Would it be possible to get Cup of Jones as audio files and have the show added to this feed? Or maybe it could have its own private feed that only patrons get the link to? I know the link could be shared to non-patrons, but that also goes for the personalized links, so it wouldn't make that much of a difference.